Beauty Professor: Beauty Professor Named a Neiman Marcus Beauty Ambassador! 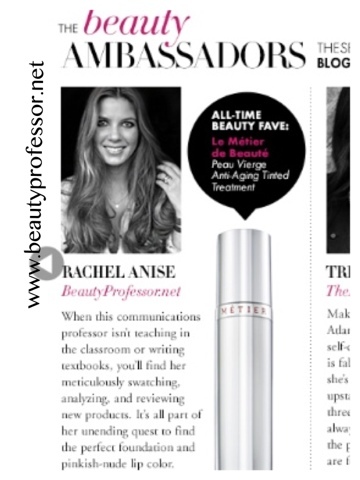 Beauty Professor Named a Neiman Marcus Beauty Ambassador! 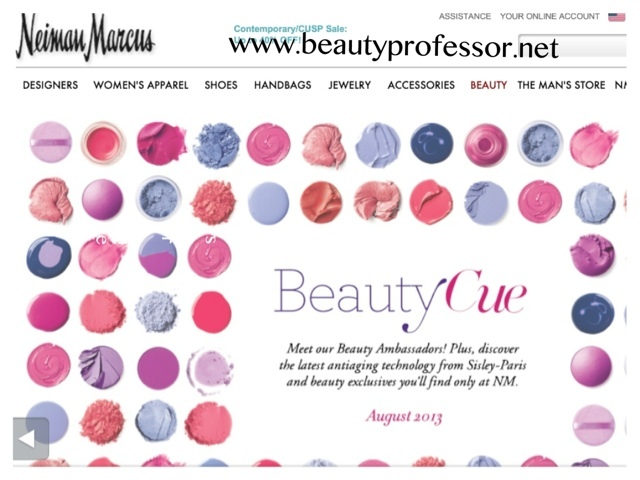 Above: The Neiman Marcus Beauty Cue is a digital newsletter focusing on cutting-edge beauty products and trends. 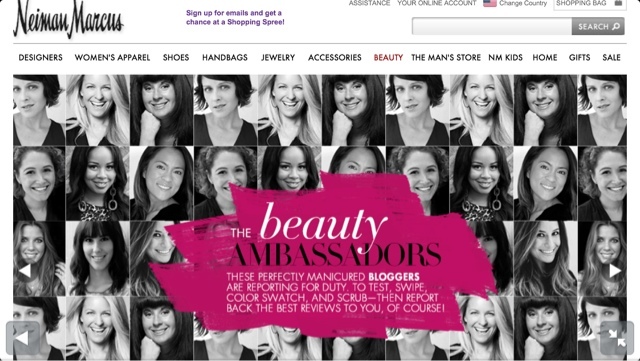 Above: The Beauty Ambassadors are introduced in the August Edition of the Beauty Cue Newsletter. Above: A screenshot of my official Beauty Cue debut!! Read the entire issue of the Neiman Marcus August 2013 Beauty Cue HERE! Next up on the blog...a review of Chanel Les Beiges and my interview with Napoleon Perdis! Thank you so much, Arielle~~I really appreciate your sweet comment! Congratulations, friend! They could not have chosen a more well-informed and talented person for this position. Can't wait to hear more about it! Thank you so much, dear friend...your kind and supportive words mean a great deal to me! Congratulations! You work SO hard providing honest reviews for us. This will be another outlet for us to read your great words of wisdom...can't wait! Thank you, Mademoiselle Michael...I love what I get the chance to do on Beauty Professor and getting to interact with lovely readers like you makes it all the more a blessing! Congratulations! That's such great news :). You most definitely deserve it, Prof.
Oh my...thank you, Twyla!! I so appreciate your kind words! Congrats to you B.P! I am so happy they have recognized your hard work and caring approach you take in informing and helping us with every review/video you do. Your honesty and timely responses have made you my fav beauty blogger since day 1! Thank you so much, Lynn! Your encouragement and positive feedback are such a gift to me and I love that we've been able to build a lovely friendship here on BP. I truly care about this blog...I'm honored to be your favorite blogger! Huge congrats Rachel!! You are a perfect pick! Sorry I haven't been writing much lately, but I have been reading. It's harvest time in the orchard and garden, making soaps, crabbing and daughter from Scottsdale is here for 5 weeks to refinish my wood windowsills! The rental cottage has been full this last month (and still) so all is good, just VERY busy. Know I'm thinking of you and wishing I could watch and "visit" more. Oh Susan...how wonderful to hear from you!! Thank you so much for your sweet words! I am so glad to hear that you are well...life on your island sounds divine. I hope you and your daughter are having a blissful time together...enjoy the togetherness! Thanks for always being so supportive! Congrats! IMHO they picked the winner :). I say that in reference to your knowledge base and incredible ability to relay that knowledge to me a mere mortal by comparison. I have learned an enormous amount of information from you and want to say thank you once again. Have a blessed one! Many thanks for your kind and heartwarming words...this blog is a blessing and I am honored to be able to share what I've learned with readers who appreciate my mad pursuit of makeup ; ) Thank you for being such a lovely reader!! xoxo and God bless you! Thank you so much, dear Krystal! I am so thankful for your friendship and support and love all the things you do on your brilliant blog as well! !